Ukrainian beauty Iana Godnia was one of the key faces that IMA placed on high alert in the lead up to the Fall/Winter 2014 season. Modelling since 2009 after being scouted by a former model, Godnia has gained invaluable industry experience and insights which have led to her pivotal breakthrough success on the Fall/Winter 2014 runways. Switching representation to Major Model Management in late 2013, Godnia underwent an image overhaul which encompassed new test shots for her portfolio, a revamping of her casting wardrobe, and a clear high fashion focus for the Fall/Winter 2014 collections. With exquisite sculpted cheekbones, soulful brown eyes, and a svelte runway ready physique, Godnia attracted key interest early during the Fall/Winter 2014 season from casting directors with the most influence. Godnia's exclusive Fall/Winter 2014 debut at Calvin Klein set the wheels in motion for a landslide of blue chip bookings including Burberry Prosum, Jil Sander, Céline, Valentino, Louis Vuitton, Miu Miu, and Alexander McQueen. On the runway Godnia exudes a chameleon-like quality and sophistication that translates to an ability to morph seamlessly from goddess of grunge at Calvin Klein, to bohemian rhapsody at Burberry Prorsum, ultra chic girl about town for Bottega Veneta, and wild at heart feral beauty at Alexander McQueen. Godnia's modelling success is a testament to the merits of sound management, an unwavering will to succeed, and precise timing. No doubt Godnia's stunning physical presence, mature outlook, and appreciation of her newly anointed blue chip status will play a prescient role in the aftermath of the Fall/Winter 2014 collections. Godnia took time out from her post-Fashion Week schedule to chat exclusively with IMA about her most cherished Fall/Winter 2014 moments, her love of bad films, the importance of sharing a common vision with Major Models, and finding her groove in New York City. 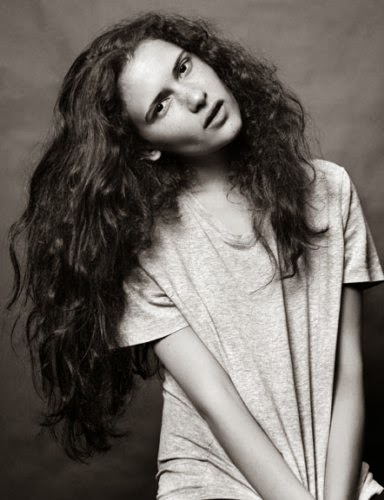 Inoubliable Model Army (IMA): Hi Iana, congratulations on a stunning Fall/Winter 2014 season and on making it onto IMA's Top 10 Newcomers List for the season! Were you stunned by the quality and the sheer number of shows that you booked, and at what point did your realise that this was your major breakthrough moment? Iana Godnia (IG): I'm thrilled! After doing the Calvin Klein show in New York, I thought "Okay, this is really happening!?" Then after the shows wrapped up in Paris, I read a list of the shows I did and I was ecstatic! IMA: Would you mind sharing your personal backstory with IMA? IG: I'm twenty-two years old and I was born in Uman, Ukraine. I got into modelling when I was seventeen, but it wasn't something I was doing full-time because I was still in school. I was discovered by a former model that does scouting in Kiev. IMA: Domonick at Major Models predicted huge things for you in the lead up to the Fall/Winter 2014 collections. What do you feel were the contributing factors to your breakthrough success this season? IG: It's hard to say. Sometimes things just click. I think the biggest contributing factor is that I don't get discouraged easily! IMA: You've been appearing on Top Newcomers Lists everywhere however you have been modelling since 2009. Do you feel that your considerable industry experience and the fact that you weren't an 'overnight success' has enabled you to cope with the intense pressure and success of this past season? IG: Not being an 'overnight success' has allowed me to fully appreciate how lucky I am. In terms of dealing with pressure, experience and maturity are definitely helpful and I think clients notice that. IMA: The Fall/Winter 2014 season began for you with a Calvin Klein exclusive followed by an overall tally of 24 show bookings including Louis Vuitton, Jil Sander, Burberry Prorsum, Alexander McQueen, Céline, and Valentino! What are your most cherished memories of the past season both on and off the runway? IG: After working many hours with the team at Calvin Klein, Francisco Costa said to me, "You're inspiring and everything looks good on you." I have so much respect for his work so it was the nicest compliment I've ever received. The hair and makeup at Alexander McQueen was so special, it felt more like Hollywood than Fashion Week! Just being part of that was amazing. I also rode my first motorcycle taxi between the Miu Miu and Hermés shows on the last day of Paris Fashion Week! IMA: There appears to be a growing trend in the industry of models hitting their stride professionally in their mid to late 20s. Do you feel that this is a mere coincidence or a reflection of the public's desire to see women as opposed to young girls mirrored on fashion's runways and in print? IG: I don't think it's a coincidence. Models in their mid to late 20s are more likely to have the maturity and experience that makes them more capable professionals. IMA: You've gone through a number of changes of agency representation before joining Major Models in 2013. What do you appreciate most about Major Model's management approach and philosophy? What key advice did your agents offer you in preparation for the Fall/Winter 2014 season? IG: I feel that Major Models has a solid understanding of my career vision. That's really important. It's disheartening when you feel a lack of consensus on such a fundamental issue. I think the best advice I received was to remember to eat and to drink lots of water! IMA: New York is a long way from your home town of Uman! Was it a culture shock when you first moved to the US, and has the time spent living abroad altered your perception of your own culture and homeland. What do you love most about New York and what do you miss most about home? IG: The airport in Kiev was a culture shock coming from Uman! But yes, the experience has changed me. There's so much diversity in New York that I never experienced in the Ukraine. And that's my favourite thing about New York. It's an easy place for different people with different backgrounds to find their groove. An experience like that is transformative; it alters your perception about everything. But there are definitely things I miss about the Ukraine. First my family and more recently Crimea. IMA: What do you hope to achieve in the course of your modelling career, and are there any key industry figures that you find particularly inspiring and would love to one day collaborate with? IG: My goal is to spend time working with inspiring people for as long as possible. My favourites from last season are Francisco Costa, Nicolas Ghesquiere, and Christophe Lemaire. I'd jump at any opportunity to work with them again. IMA: Modelling can at times seem like an all-consuming profession especially during Fashion Week! What do you do in your spare time to unwind and decompress from the world of modelling? IG: I eat amazing food... I like cooking and discovering new restaurants. A little shopping, I watch some bad movies and occasionally a good one ;-). And I travel... anywhere warm, or scenic and authentic. IMA: Beauty is very much in the eye of the Beholder. What is your definition of true beauty? IG: When thinking of true beauty, my mind goes to nature before humans. IMA: A model's sense of style plays a pivotal role at castings and off duty with the prevalence of street style photographers. How do you dress off duty, and was there an outfit that you wore on the runway this past season that you have been unable to get out of your mind since? IG: I loved the pink dress I wore in my first look at Valentino! Off duty, I focus on being comfortable with a casual cool. It feels good hanging around in a bikini, but you have to mix it up and surprise people.